I have a confession to make. For someone who adores Indian food like I do, I really don’t like most Indian desserts. I generally find them too syrupy sweet and too liberally dosed with cardamom and rose water – tastes which I like but require a restrained hand. So I am always on the hunt for desserts from other cuisines where I can play with the flavorings and give them an Indian slant. 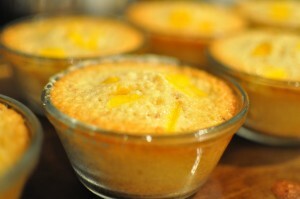 This mango ginger clafoutis is one of my plays gone terribly well. Clafoutis is a French dessert typically made with cherries that are covered with a sweet, eggy custard and baked. Not something that screams India, I know. The inspiration for my mango ginger version comes from an unexpected place – last month, I assisted in a kid’s cooking camp led by Chef Carlin Breinig at the fabulous Atlanta cooking store and school, Cook’s Warehouse. The campers ranged in age from 8-14 and their enthusiasm for cooking (especially desserts) was absolutely infectious. Each day was organized by color, for example on the first day we made red foods. Part of that menu was an almond raspberry clafoutis recipe courtesy of Bon Appetit. The dessert was relatively easy to make (after all the kids had to be able to do it with our supervision) and when finished had the most lovely almond flavor that played beautifully against the raspberries. Since nuts are so predominant in Indian desserts, I immediately thought the recipe would be perfect for a little Indianization. I think I just made that word up. For the fruit, replacing the raspberry with mango was pretty obvious. But I also wanted to give it some layers of sweet spice so I added fresh grated ginger and ground ginger plus a touch of ground cardamom. The result was a beautiful, sophisticated dessert whose complex flavors slowly unravel on the tongue. The original recipe had a sauce that went with it but I found I liked my version better sauce-less – plus one less thing to make! Some freshly whipped cream would be a delicious garnish. This dessert is a showstopper and will really make your guests take notice. No one needs to know that it is basically child’s play. 2. Finely grind almonds in a food processor until they have the consistency of sand. 3. Transfer ground almonds to a large bowl and add sugar, egg whites, flour, orange juice, fresh ginger, ground ginger, and ground cardamom. 4. Melt butter in a heavy saucepan and cook until it turns nut brown, stirring frequently. Should take 4-5 minutes. Cool for 5 minutes. 5. 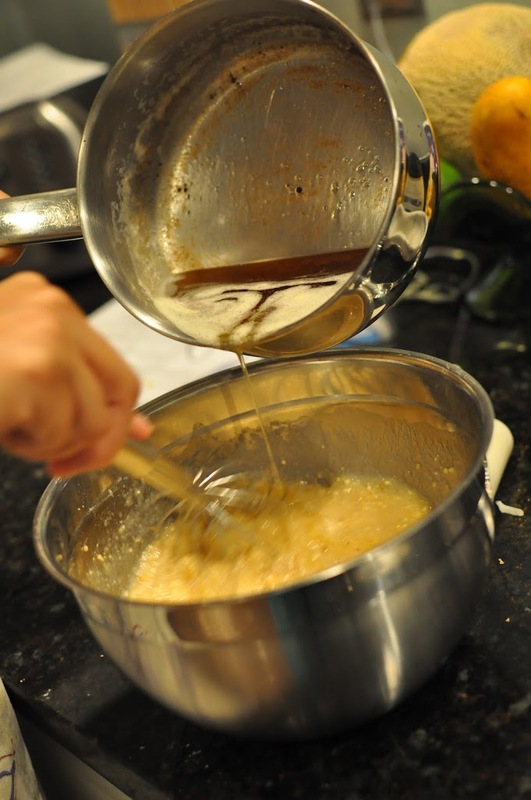 Whisk warm butter into almond batter and well blended. 6. 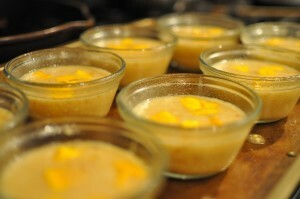 Divide batter equally among eight, greased 1 cup custard cups. I used Pam baking spray to grease mine. Batter should come up about 3/4 of the way. I put all the cups on a cookie sheet for ease in getting in and out of the oven. 7. 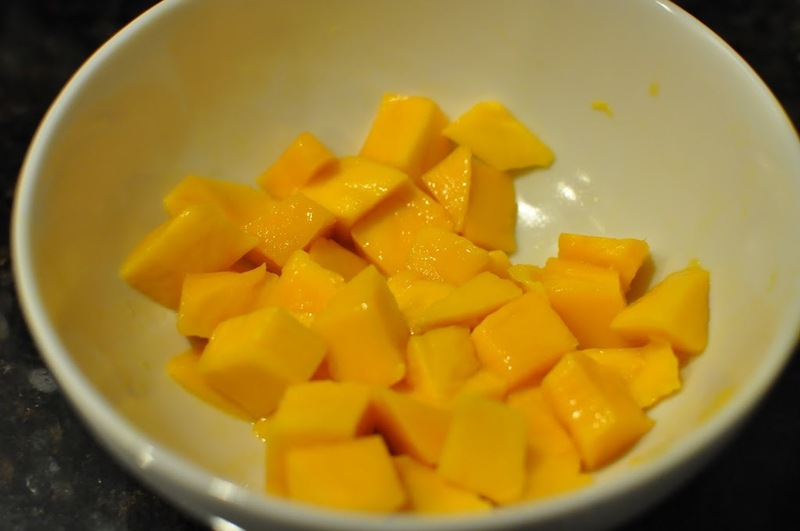 Drop in 5-6 pieces of mango into each cup. 8. Bake until golden brown and set int he center, about 25 minutes. Cool for at least 15 minutes before serving. These are beautiful served in the bowls or un-molded. Garnish with fresh mango and whipped cream if desired. I had a few leftover and I refrigerated them covered with plastic wrap after they cooled completely. They were perfect the next day after a quick 10 second blast in the microwave to take the chill off.